Downing just two glasses of fizzy or sugary drinks a day can raise the chances of heart failure by almost a quarter, new research suggests. Soft drinks have previously been linked to high blood pressure, heart disease - which can be covered among holidaymakers by a medical travel insurance policy - strokes and diabetes. But the Swedish researchers say their findings link the drinks with heart failure for the first time. The team from Stockholm's Karolinska Institute quizzed 42,000 men aged between 45 and 79 about their consumption of soft drinks and sweetened juice drinks. The researchers kept tabs on the men for an average of 12 years, during which just over 3,600 new cases of heart failure were diagnosed. Just over 500 of the men died from heart failure. Writing in the Heart journal, they conclude that drinking two 200ml servings of sweetened drinks a day - the equivalent to just over a standard-sized can - is linked with a 23% higher risk of suffering heart failure compared to men who do not consume any of the drinks. The association, they add, is still evident even when those who were diagnosed with heart disease during the first five years are excluded from the analysis. The researchers say because their study was an observational one they cannot conclude that sweetened drinks are a definite cause of heart failure. But they add that their findings could help doctors deliver dietary advice as part of heart failure prevention strategies. An editorial written by Professor Miguel Martinez-Gonzalez and Professor Miguel Ruiz-Canela to accompany the study points out that those who drink a lot of sweetened drinks often also have a poor overall diet. 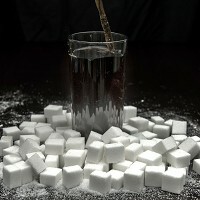 Consumption of sweetened tea and coffee and fruit juice were not included in the study and the researchers drew no distinction between beverages which were sweetened with sugar and those that contained artificial sweeteners. Previous research has also linked sweetened drinks to alterations in insulin and glucose levels.